One of three types of photographer is probably reading this: 1) A crusty old pro who knows everything about film photography and could teach me a thing or two; 2) A gearhead with the latest digital kit who stumbled upon this site while looking for Thorsteen Overgaard’s latest missive on the magical properties of the Leica Experience; or 3) A younger photographer increasingly turned off by the dummy-proof automation of modern computerized cameras. This post is for those in camps #2 and #3, although I suspect a good portion the #2’s will dismiss it as the rantings of a bitter old man with no relevance to their Nikanon or Leica M or X and that big A on the shutter speed dial (“Dentist Mode”) that takes care of such pedestrian concerns. For those of you still paying attention, let me tell you a story. Back in the day (i.e. until about 40 years ago), most professional cameras were not automated in any way. No electronic or computerized circuits to do any thinking for you. Just a purely mechanical light tight box with an aperture and shutter speed dial to control the flow of light onto the film plane. No exposure meter. This was true of the “real” Leica M’s, the M2/M3/M4s hand assembled in Wetzler, the ones loved and used by most of the 20th century’s iconic documentarians. Yes, we had those annoying meters that would slide onto the accessory shoe, but they were bulky and inconvenient and they marked you as an incorrigible dilettante. Real photographers knew how to expose, external meter be damned. Practice makes perfect. One benefit of using a meterless camera is the skill you develop in guestimating exposures. When I learned the intracacies of exposure in the 70s, I walked around with a hand held meter and estimated exposure for various lighting situations. After a few weeks, it became instinctual. Once you get the hang of it, the ability to see and correctly judge light, you’ve freed yourself from the tyranny of the machine. You’re no longer a monkey pushing a button. You see more; you notice light in ways you’d miss when using the A setting and letting the machine do the thinking for you. It also makes a great parlour trick, at least with your technologically sophisticated digital shooters using matrix metering on their bizooka sized Nikons and Canons. Never miss an opportunity to screw with them at their expense. I recently had a conversation with a nice woman, the wife of a friend, who has taken up wedding photography as a profession. We talked photography, and cameras, and the business of photography. 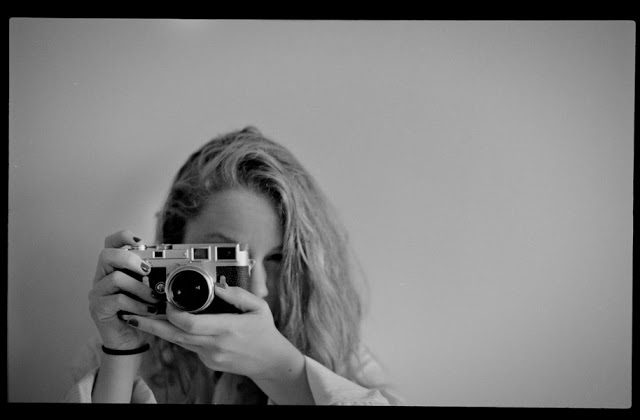 I showed her my humble little Leica M2, a vintage curiousity to her, no doubt, and we spoke about how it worked, and about the subject of manual exposure, of which she was unfamiliar. I explained the Sunny 16 rule and demonstrated how it worked in practice, correctly estimating a number of varying exposure situations which she subsequently confirmed with her dSLR. She seemed amazed that i could accurately “guess” the correct exposure in differing lighting situations while she pushed buttons and changed meter matrixes with a serious expression on her face. 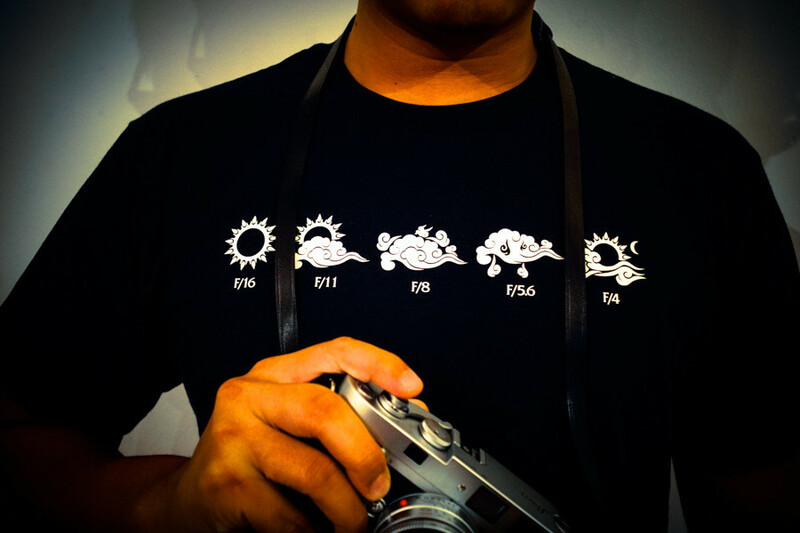 On a cloudless sunny day, the correct exposure for any subject is f/16 at the shutter speed nearest to the film speed. 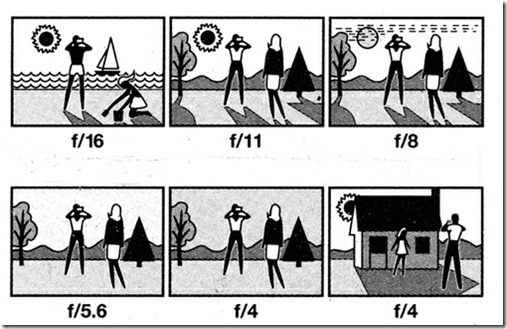 For example, if you are using ISO 125 film (the now defunct Plus-X), the correct exposure would be 1/125 second at f/16. This is called the “Sunny 16” rule. The “Sunny 16” rule gives us an base setting to use in mentally calculating exposure since it contains all the elements you need to know for proper exposure: film speed (ISO 125), aperture (f/16) and shutter speed (1/125). Is it 100% accurate? No, but neither is your in camera light meter, which works with reflected light. If you need consistent, accurate meter readings, you need either 1) A grey card or 2) a hand held incident meter. As a practical matter, your film has enough latitude to compensate for a guestimate a stop or two off. You ‘might’ lose some shadow detail, or your photo may need to be printed on a non-standard grade paper (or you could just fix it in Lightroom), but you’ll get the shot, which, of course, is what matters. You’re not Ansel Adams. Stop obsessing about tonal values and shoot the damn thing. This is not spectometry, its photography. The more you practice the better you will be able to simply look at a lighting situation and immediately know the correct exposure for your purposes. The “Sunny f/16” base setting, combined with your knowledge that each change of one step in a factor doubles or halves the exposure, makes it easy to select a correct exposure for any photographic situation you may be confronted with. Each step up or down in one variable represents a doubling or halving of the amount of light required to make a correct exposure. For example, an overcast day would halve the light falling on the subject. If the light reaching the film is cut in half, ONE other variable needs to be changed to increase (double) the amount of light. In this case the shutter speed could be reduced to 1/60 second OR the aperture could be increased to f/11 OR the film speed could be increased to ISO 200. Any ONE of these corrections would provide the correct amount of light. Make the correction that best suits your photographic purpose (decreased depth of field — the distance in front and behind of the subject that is acceptably in focus — or enhanced apparent subject motion). In the same sense, a change in any of the variables can be offset by a reciprocal change in any other variable. For example, you may need a faster shutter speed to stop action. If you choose 1/500 second, the light will have been reduced by two steps (cut in half from 1/125 to 1/250 and cut it in half again from 1/250 to 1/500). You could compensate for this by opening up the aperture two steps (from f/16 to f/11 will double the light and f/11 to f/8 will double it again). You could also make the same correction by increasing the film speed by two steps, called “pushing” a film (pushing an ISO 100 film to ISO 200 doubles the light and from ISO 200 to ISO 400 doubles it again; so, a 100 ISO film rated at 400 ISO would be a “two stop push”). Or, you could increase the aperture to f/11 and push the film to ISO 200. Moving to the right, each number is twice the preceding number, and represents twice the sensitivity to light as the preceding number. There may be some intermediate steps (such as 64 or 125) on your dial. Set the light meter or camera for the same number that is on the film. This leaves only two things to adjust to achieve the correct exposure while making a photograph; shutter speed and aperture (f-stops). Again, each number moving to the right is half the value of the preceding number, and represents half as much light as the preceding number. Like the shutter speed series, each progression represents half as much light (moving to the right) as the preceding number. The numbers represent the ratio of the focal length of the lens to the diameter of the lens diaphragm opening. The designation “f/2” means that the diameter of the aperture is 1/2 the focal length of the lens. The designation f/32 means that the diameter of the aperture is 1/32 the focal length of the lens. f/2 on a 100mm lens means that the diameter of the diaphragm opening is 100/2, or 50mm. The amount of light reaching the film is dependent on the SURFACE AREA of the opening, NOT the DIAMETER. The method of calculating the surface area of a circle is Pi times the radius, squared (Pi is approximately 3.14; the radius is half the diameter, squared means that the number is multiplied by itself). Therefore, in our example, the surface area of the opening would be 3.14X25X25, or approximately 2000 sq. mm. Looking at the next f/stop, which is f/2.8. 100/2.8=35.7mm. The surface area would be 3.14X17.85X17.85. If you multiply it out, you will see that the surface area is now approximately 1000 sq. mm, or HALF the surface area of f/2.Therefore, each succeeding smaller aperture lets in half as much light as the previous f/stop. This entry was posted in Film photography, Leica Film camera, Uncategorized and tagged Manual exposure, Meterless Leica, Sunny 16 Rule on January 19, 2015 by Leicaphila.